I love meatloaf, especially the top and end pieces that are coated with that sticky sweet glaze, don't you" As a matter of fact, picky-picky husband and I have been known to make leftover meatloaf sandwiches, using ONLY that outside saucy layer of meat. 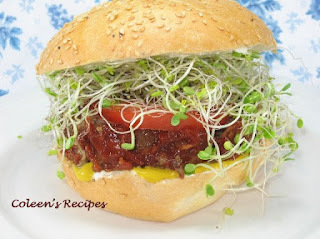 With that in mind, I decided to try "baked meatloaf burgers" and they were a big hit; we ended up with the best part of the meatloaf in EVERY sandwich!! Mix Glaze and brush over the patties (use all of the glaze). Bake patties in a preheated 375° oven for about minutes or until they are cooked through (cooking time depends on how thick you make your patties). This recipe also makes wonderful sliders on little dinner rolls. Don't try to FRY these burgers (with the sauce on them) because it will scorch and burn quickly; the sauce really transforms magically in the oven, so it is worth the effort.